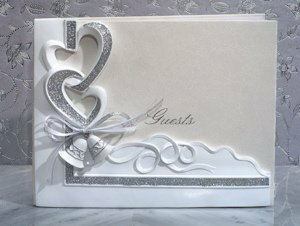 You'll be able to look back on the fond memories of your extravagant day with this elegant Wedding Bells Guest Book. A lovely way to record all the signatures and well-wishes from your friends and family, this graceful faux leather guest book features a hanging wedding bells design accented with a sculpted pair of hearts in a shimmering silver glitter finish on the cover along with 50 lined pages inside. The book is nicely gift boxed and measures 8" x 10".